We had two opportunities this month to show solidarity with our neighbors, especially important since Refugees and Muslims are often groups who are kept at a distance and treated with suspicion. June 20 was UNHCR’s World Refugee Day. The Denis Hurley Centre’s (DHC) Refugee Pastoral Care worked with other organizations in the Refugee Service Providers’ Network to offer a great day of activities in our Gandhi-Luthuli Peace Hall. Live music was provided by René Tshiakanyi a French-Congolese singer, songwriter and guitarist, who also entertained the crowds outside in the Mall. A film about corruption in Senegal was screened followed by a discussion and opportunities for people to get to know each other. Food was then served for hundreds. Pleasingly, the event was attended not only by refugees from many different African countries but also by South African nationals keen to break down barriers. (Members of the 3 Abrahamic religions breaking the Ramadan fast with dates. 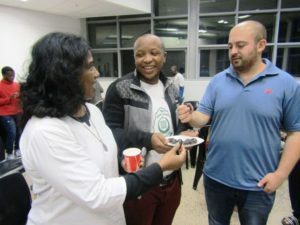 (From l to R) Sr. Cathy Murugan, HF, Sufiso Duma with Islamic Propagation Centre International (IPCI) and Ohad Rooiblatt, an Israeli volunteer with project TEN (Project TEN is an international development program that operates volunteer centers in developing areas). The next day, being one of the last days of Ramadan, we encouraged non-Muslims to observe the fast as a way of joining in prayer with our Muslim brothers and sisters across the city and across the globe. Then at 5pm, as the rays of the sunset filled the upstairs room, we broke the fast accompanied by our Muslim partner organizations, Islamic Propagation Centre International (IPCI), Grey Street Mosque, South African National Zakáh Fund (SANZAF) and RAUF (Refocus and Upliftment Foundation). A good conversation was held about Ramadan traditions and our healthcare team were able to find out ways to help the many Muslim patients who come to our clinic. Delicious snacks and drinks were then enjoyed by all.